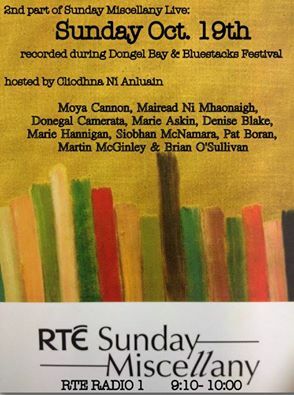 The Sunday Miscellany programme that I am reading in will be broadcast this Sunday on RTE Radio 1 at 9.10am – some lovely writing and music from every involved in the recording at the Abbey Arts Centre in Ballyshannon earlier this month. Part 1 aired last week and sounded great so I can’t wait to hear how Part 2 comes together. This entry was posted in Non-fiction and tagged Ballyshannon, Donegal, Donegal Bay and Bluestacks Festival, radio, Sunday Miscellany. Bookmark the permalink.